I’ve now been playing with techniques using the Altenew Artist Marker Refill inks for the last several days. These are alcohol inks and they are fabulously fun to play with. Altenew Academy has a class that is live right now called Rethink Re-Inkers. I didn’t realize that it would be about alcohol re-inkers. In all honest, it really never occurred to me that I would enjoy doing so many things with the alcohol maker refills inks other than actually refilling my markers! I’ve played with my dye ink refills using lots of different techniques and I was actually expecting the class to be all about those. It was a delightful surprise to realize I could use the alcohol ink refills to create so many new projects. How gorgeous are these cards? Those backgrounds look like they were printed on glossy photo paper up close. They have quite a beautiful shine to them. I used Yupo paper, rubbing alcohol and Alcohol Blending Solution to create 3 backgrounds. These are the two that I LOVED. I didn’t go overboard with the ink. I added mostly the lightest color, then a little less of the medium color, and then just a couple of drops of the darkest color. I added either isopropyl alcohol (rubbing alcohol) or alcohol blending solution from Ranger. They both worked about the same. I also blew on them after I added the blending/alcohol to help mix the paints. Next time I will use a straw to blow them around so I don’t have to get my face down next to them. I am also going to invest in a small fan to use when I work with them because the fumes really made me queasy after a time. I actually stopped and came back to finish the cards today. I’ve used a couple cover dies over the top of the backgrounds. I love cover dies. They give you some pretty details on your card without completely covering the entire pretty background you just made. Plus, the do cover up some of the parts that didn’t turn out as pretty as the rest of the background. I just adore a little yellow mixed in with some green. These are my comfort colors. 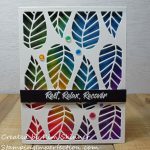 This card is made with Altenew’s Leaf Frame Cover Die. I thought it would be great for scrapbooking and for cards that have those great quote sentiments for the center. 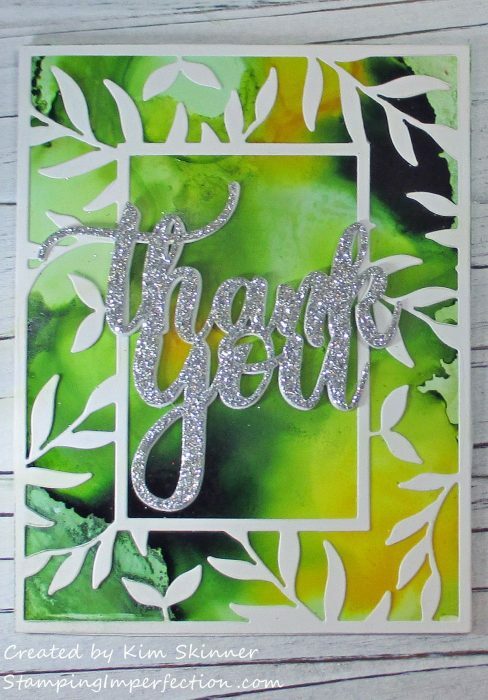 The Thank You script die is also from Altenew. I’ve popped that up on a piece of fun foam that I also die cut out and layered the silver glimmer die cut on top to really pop it up. The cover die is just white card stock. Such a simple and addictive technique for the background and it really made for a quick and easy card to finish up. 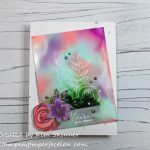 I can see myself spending a couple hours mass producing alcohol ink backgrounds so that I have a stash that I can pull out and used to create a quick and easy card like this one. I LOVE, LOVE, LOVED this background! I really wanted to show this off. It would make a great stormy sea or a great stormy sky. This cover die is from MFT Stamps and it is their snow drift cover up die. I’m using it for waves here as you can see. 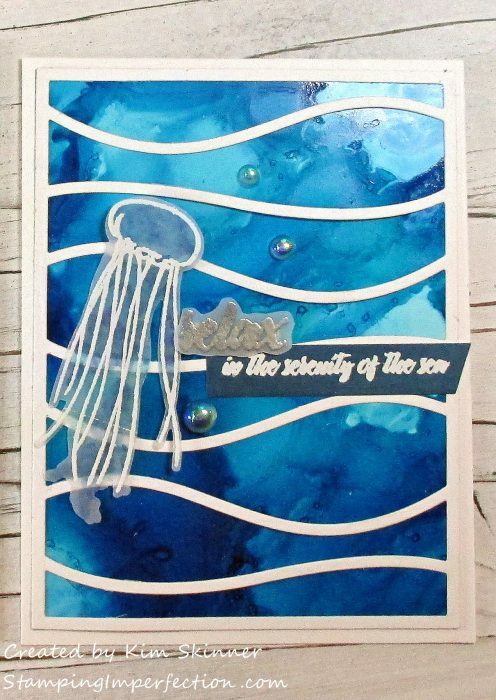 I added my favorite Painted Jellyfish stamp set from Altenew. I’ve used this for cards and scrapbook pages on multiple occasions. It was one of the first Altenew sets that I purchase and I’ve never actually layered it like it was designed to be layered! I often emboss it and do some kind of background technique. This is embossed on velum and I have added some color using my Altenew Artist markers. I’ve used the sentiment so many times that I think I need to give it a good cleaning with a Q-Tip to clean out the crevices so you can see the spaces between the letters. It says “Relax in the serenity of the sea”. We live on the East Coast in a little fishing village with a lot of maritime history and we love to walk along the piers in town and sit on the benches at the beaches and parks watching the sailboats, fishing boats, and the yachts come and go. It’s just beautiful and it really is serene. 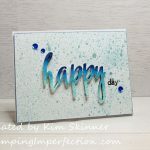 You can see how perfect my favorite Studio Katia Clear Round Drop Mix looks with this stamp set and background. I really love how this turned out. Those blues in the background are fabulous! Green Background: Frayed Leaf, Forest Glades, and Warm Sunshine. The embossing powder is also from Altenew. The silver is their antique silver. This is the Rose Filament Die from Altenew. 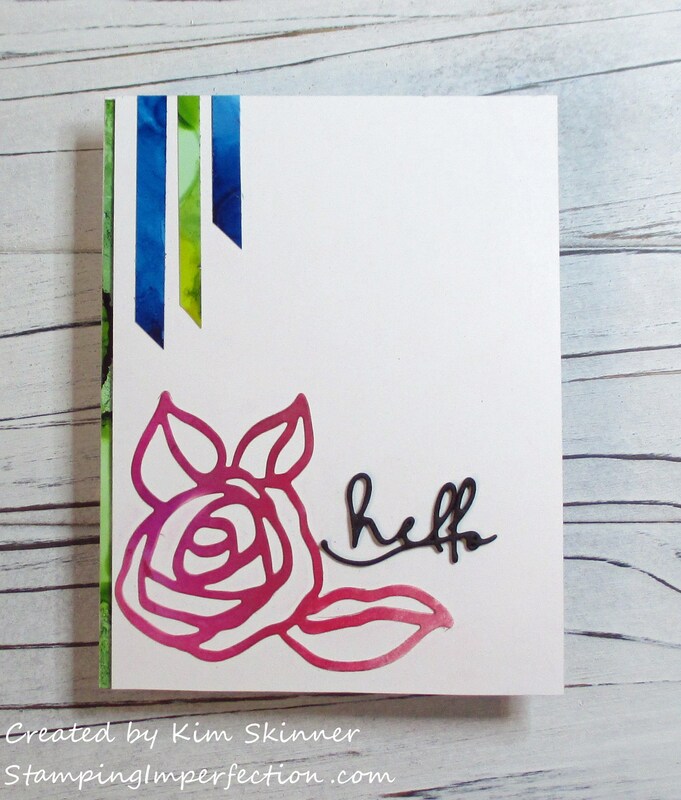 It is a set of 6 or 7 different rose and leaf designs that really create fabulous focal images when you add them to a card front. I used Altenew’s tiny hello script die as well. The rest of the pieces are the scraps from the other two cards that I trimmed off the edges. I liked them so much, I could not waste them! I have several more of these roses cut out in different sizes, but I’ll save those for another project. I’m thinking of using them on a scrapbook page. All in all, I had a lot of fun playing with these inks. I love experimenting and figuring out what I can get them to do. I have a few of the Ranger Alcohol inks that I plan to play with as soon as I have time to see how they behave and react compared to these. I just love knowing that I am stretching my craft dollars by using a product for more than what it was created for. 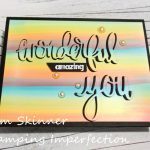 I hope you have some ideas or inspiration to take another look at the ink refills you have around to see what else you can do with those besides refill markers and ink pads! 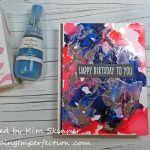 Don’t forget to use your cover dies as your making pretty backgrounds too! Thank you so much for stopping by! I have 3 videos that I need to put the finishing touches on and upload for you to see on these techniques. Hopefully, I can get to one of them tonight! Happy crafting and have a fabulous week!